Imagine you have 3% battery remaining on your smartphone and only one extra outlet on the other side of the room. It’s almost torture to listen to text messages or email alerts ring aloud as you sit comfortably perched upon the desk from a distance. To check or not to check, that is the question. As trivial as this scenario may sound, the struggle is real, and has greater implications in other contexts, such as learning or working environments, where you wouldn’t want people tripping over extension cords or forced to plant themselves near an outlet. As a whole, we have become co-dependent on our portable devices, addicted to technology and all its wonders. That is all fine and well, empowering, in fact…. until your reduced power mode alert pops up, and you are once again enslaved by wires, in order to operate your wireless devices… a bit ironic, don’t you think? The solution to this not so wireless conundrum? Introducing EnerGEE! by Interior Concepts, a battery system that allows you to turn an Interior Concepts table into a wireless charging station. This portable battery power accessory is packed with some serious punch- lasting up to 8 hours on a single charge, while juicing up to 10 smartphone or 5 tablets on a single cycle. Connect any USB enabled device to charge without the mess or hazard of extension cords. The EnerGEE! battery system enables you to create a mobile battery powered charging station which gives you greater flexibility when creating work and learning environments. The EnerGEE! battery system features a lithium iron phosphate battery which boasts several advantages over other lithium ion batteries. SAFETY: Lithium iron phosphates are much more thermally and chemically stable than lithium cobalt oxide commonly used in many consumer product batteries, which means there is less risk of a battery igniting when mishandled or overcharged. In addition, the non-toxic chemicals are safer than the hazardous cobalt dioxide which can cause irritation to the eyes, skin or respiratory tract, and can cause serious damage if ingested. ECO-FRIENDLY: phosphates used in LFP batteries are non-toxic chemicals that do not pose the same threat as cobalt dioxide does if it enters into water supplies or soil when improperly disposed of. Lithium cobalt dioxide is considered extremely carcinogenic. Pulmonary, neurological, and respiratory problems have also been connected to cobalt exposure. CONSISTENCY: Because of the LFP battery’s relatively consistent discharge voltage, it will output the same voltage until it is almost completely exhausted, 90% of each cycle, which means your devices will charge just as fast when your EnerGEE! system is fully charged, as it will just before it needs to be recharged for the day. ENDURANCE: LFP cells experience a slower loss of capacity which means that after a year of shelf-life, and LFP will have the same energy density as a more powerful battery that declines more rapidly. In the long run, a lithium iron phosphate battery will outlast and out perform others. Interior Concepts is all about custom solutions; from commercial office furniture to school furniture solutions, that is why the EnerGEE! battery system can be installed into most Interior Concepts tables. There are several ways to take advantage of portable charging capabilities in any setting. 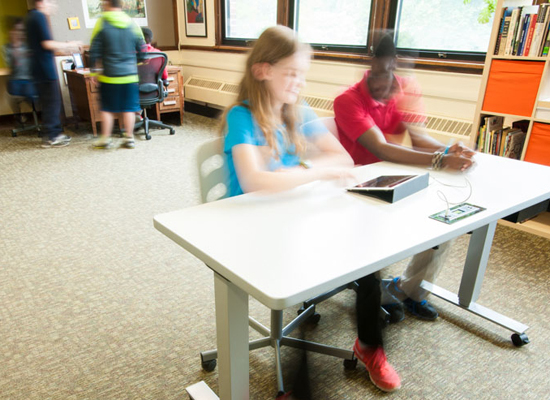 CLASSROOMS: Whether you are utilizing individual tables, group tables, or modular educational and school furniture, you can install EnerGEE! battery accessories at each, for technology integrated classrooms in which students are continuously using mobile devices and may need charging more frequently. Alternatively, you can create an interactive station for students to work at for specific projects or on rotation. OPEN OFFICES: So you love the open layout of your offices, the collaborative spirit in the air? But how do you power your devices at freestanding meeting tables and gathering spaces without a mess of wires and extension cords? Again, you can install EnerGEE! systems at various tables located throughout the office to create mobile charging and meeting stations that can move freely wherever you need them. COMPUTER LABS: Let’s face it, computer labs are already interwoven with wires, from power sources to accessory cables, who needs another wire in the way? Installing the EnerGEE! battery system in tables can give users the opportunity to charge mobile devices at charging stations while they work at computers without taking up an outlet or heaven-forbid, unplugging something else. Similarly, it allows users to connect additional devices to power when all of the computer’s USB ports are in use. A few more gold stars for this super-charged superstar. The EnerGEE! accessory features water and spill resistant mounting flush with the table, a gauge to indicate charge level, and automatic shut-off to protect the battery from damage. Finally, as with all Interior Concepts furniture, the EnerGEE! battery system is made in the United States and is satisfaction guaranteed. To learn more about EnerGEE!, download the product brochure!